I am from Southampton, UK and experienced minor car accident in October 2009 where I was hit on the left hand side of a car driving approx 20 mph. This isn't the first car accident I have had, anyway initially I only suffered from shock, but a week on the pain began and I was unable to sit on anything, so I saw the Dr who gave me a cortisone injection, which made my condition much worse. Thereafter I had an injection once a month for 2 months with the same effect. From March 2010 - February 2011 I saw a chiropractor in Botley, Southampton, my Dr was called Pam and although pain wasn't instant and I had bad days or weeks I felt overall I was getting better. By September the pain was practically gone, but I did have an unusual sense of sitting on a pointy bone. 3rd December 2010 my partner caught a violent tummy bug and passed it onto me, I was in a poor state for 3 days and after that the pain returned in force. I could no longer lie down without pain and sitting was so painful I felt sick, so the sleepless nights and tears started. The Chiropractor from December 2010 - February 2011 could not ease the pain to my disapointment. So I saw an orthopaedic specialist called Lance Beatty at the Romsey Outpatient clinic who said that I suffered from Coccydynia and couldn't tell me any more as to causes other than Physio and acupuncture would help. When I enquired into an MRI scan or an X-ray he dismissed this and said he knew it wasn't broken and by having these scans would provide him with no more information on how to treat the condition so it was unnecessary. This was Feb/March time, so off I went for 3 sessions of physio and acupuncture at the Nuffield Centre, West End, Southampton along with a trial with a TENS machine. Again none of these helped So I began seeing a lady who uses a machine called the Interx http://www.interxclinic.com/ the first month really helped and I could lie down in no pain again in fact on the first session I could sit down for 10 minutes with no pain!!! I was given homeopathic medicine and you guessed it then I got worse - she said this was normal with treatment with the medicine and Interx and will be worse before it gets better. By May I was at where I was in March with no improvement and no long term benefit from the Interx so I bought my own in the hope that this would be better. So far 4 weeks and no change, I am chatting to one of the Drs, Zulia Frost, who is friendly and helpful but I am not sure how much patience or faith I have in this treatment, maybe I am not giving it enough time but I would have hoped for some positive response by now. Now my condition has worsened to the point where exercise is at a minimum and walking can be touch and go due to pain. I'm a wreck and I don't think it will be long before my world falls apart, I can't cope... I even spoke to the NHS emergency help line one night I was in so much pain, they advised I go to hospital (2am) so I did in Southampton they said they couldn't help me because my condition was ongoing, chronic and needed a specialist, that they couldn't scan etc and that my case was not an emergency or seen as urgent on the NHS priority list. After this enough was enough, so I chased my 2nd referral with the first orthopaedic chap when I tried calling to get an appointment the receptionist said they weren't seeing anyone for this condition in Hampshire! This was unacceptable so I got my GP involved who said this only applied to new patients (still awful) and sorted me an appt for 17th June unfortunately for me this got cancelled to the 24th June which is very annoying after waiting 2 months originally. Seems to be a long waiting list from the NHS due to budget cuts (well that's was the GP said). Pain seems worse on the right hand side, I don't know what this means. My GP gave me amitriptyline to help sleep which didn't work so changed it to Lyrica, this can help me sleep but I do get bad days. I've tried 2 types of pain killer, neither worked and I reacted badly one was called dihydrocodeine. So of course I ended up on anti depressants (Citalopram) because I am depressed but again they did nothing and made me fell sick so after trying 10 mg and 20 mg this had to stop. A service called iTalk was then introduced to me it's some sort of NHS a psychologic therapy service to help me cope http://www.italk.org.uk/ but they say my thoughts and feelings of wanting to die, feeling useless, depressed, worthless etc are all normal because I am suffering with a life changing condition. I honestly don't know anymore, I don't know what I think, I got better with a chiropractor, then got worse and she couldn't help and no one can say why but everyone says they can fix me yet the treatments don't work. I am looking into ultrasound treatment and hydrotherapy http://www.lbhealthcare.co.uk/ in Whitley, Fareham but only out of desperation. I've been seeing Dr Michael Durtnall from the Sayer Clinic (see Doctors and specialists in the UK, London) now for some time and wanted to say despite some up and downs every month I am now about 70% better. I have to be sensible with my activities, not sit down too long and sit it the correct position, so lots to think about and do to stay healthy. I see him every month and he is very pleased with my recovery. The only downside is I am struggling to improve my posture and until I do so I will never have a full recovery or come off my heel lifts. I am finding this the most difficult part of my recovery as a change of posture is automatic and does not feel natural. I do struggle remembering what to do and don't have much confidence but I will keep trying. I must exercise 3 times a week and I'm hoping by my next appointment in December I will be a step closer. I would like to say thanks to Dr Michael Durtnall I am 90-95% better in pain. It was 99% but I had a fall which bought some pain back. I am still on the heel lift for being wonky but apparently my posture & neck are slowly starting to improve. At 78% but goal is 90%. In not too confident in that though. I've not needed manual manipulation for a while & my new employers have supplied me with the office equipment I need for my condition. However I received my NHS MRI results & it turns out I have a historic tail bone fracture which has healed incorrectly. Mr Chris Dare wants to manipulate & inject a cortisone injection in my joint via x-ray. I don't know the ins & outs because he didn't show on my appt yesterday do I got my info from an unqualified physiotherapist after having waited 4 months! They re-booked me in for 6 weeks time with Chris Dare to discuss my results & the surgery properly. Dr Michael Durtnall doesn't advise I proceed as it could make it worse. Although the physio lady said results were very good with this treatment so I'm very confused. Although the horror stories from the Internet say otherwise. I saw Mr Chris Dare privately, he advised of the injection but said it didn't have great results and an improvement was uncertain, I also have bruised bones in my coccyx. I said I would think about it and saw him 6 weeks later on the NHS. He said in a letter results were 70-80% improvement?!? When I raised this he said that's based on a high pain level. He now advises against the injection as my pain level is on 3 out of 10 and most women my age recover naturally within 5 years and as I'm approaching 3 & the pain has improved he feels I should continue with Dr Durtnall. Apparently injections are not a cure & can aggravate conditions. He will also not do more than 3 on a person so should it make me worse there would be no other option for pain relief. Good news is I have no scarring or fatty lumps from my GP cortisone injections which was an original concern with box Dr Durtnall & Mr Dare. I've decided to see how I get on without the infection. I see Dr Durtnall in a week so fingers crossed I have improved since I last saw him. I don't think I'll ever be better or off the heel lifts but I've decided to reduce my level of medication now I have improved, hopefully there will be a time when I won't need it. It's scary how quick the condition can worsen making me think I will never get permanently better that the regular appointments and exercise just manage/hide the pain than cure it. And if this is me at 24 what hope do I have at 60 or 80 as an old lady, how will I exercise and travel to London every 8 weeks. Or worse what do I do if Dr Durtnall is no longer available, I will digress very quickly. The NHS offered no support and I am permanently ruined. So I think that's the end of my story, I will never get better than I am now I will have to constantly exercise, have appointments, ergonomic chairs and live on prescription medicine. No more horse rides, safaris, roller coasters. I am a sad and destroyed 24 year old reliant on these things, scared and only have any quality of life because of my treatment and Dr Durtnall for that I'm thankful and grateful. So although I'm depleted I would be nothing without these treatments. I would be even more miserable and more in pain, unable to work and in a bad place. So this is me signing out, getting as good as I ever can get. Although I still need regular care with Dr Durtnall at the Sayer Clinic I can now travel over 3 hours at a time before having pain. 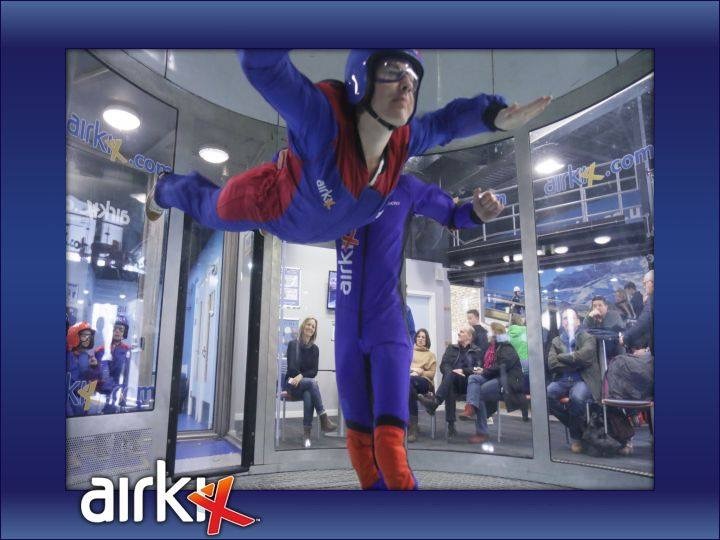 I even managed a trip to Hawaii and went indoor skydiving. I must maintain my lifestyle but am happier then I have ever been! He changed my life, I've gone from being unable to move to being 90%+ normal, given I manage my condition.